After finishing work today for the Christmas break I feel ready to get into my art again. My plans for these summer hols is to paint and plein air sketch. I have all good intentions and do feel some excitement about this idea; but time is always whizzing by at this time of the year. Happy Christmas and enjoy your holiday break. Degas exhibition NGV Melbourne- last day and I got to see it. 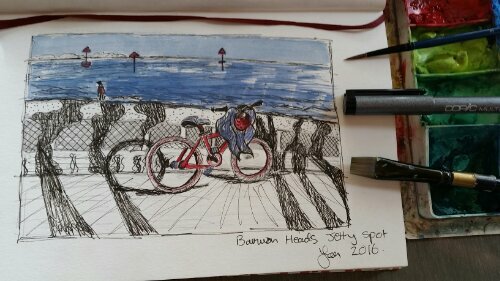 Sketching near the jetty where people are fishing. A balmy dusk time of day. One problem though; some kid came and grabbed his bike to head off so had to get down what I could remember. Such a beautiful spot in Port Douglas and this jetty was busy with weddings at sunset each day we were there. I was taken by the array of white lanterns assembled to dress up the wedding jetty. I miss sketching in this orchard garden which is where I had some lessons for a while.